Don’t Panic! A Practical Guide to Twins, Triplets and More provides positive support to multiple birth families as they embark on the adventure of a lifetime. 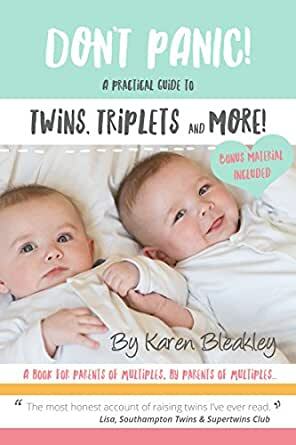 After getting bored of hearing comments like these during her twin pregnancy, Karen Bleakley decided it was time somebody compiled a book for parents of multiples that was actually written by parents of multiples. Karen set up a blog and then went on to collect contributions from over 100 parents of multiples to create the book she wished had been available when she was expecting. Instead of creating unattainable routines and judging parenting skills, this practical guide book is packed full of real-life stories and tips from families. Don’t Panic! A Practical Guide to Twins, Triplets and More explores pregnancy, birth, the newborn stage and the first precious year. Backed up by a stack of invaluable free bonus material online, every stage of this book has been shaped by an army of multiple mums and dads so that it packs in everything you need to know. The book can also be given as a gift to family and friends of those expecting multiples to give them a flavour of what to expect from the new arrivals. If you don’t have multiples yourself, it’s impossible to understand the unique challenges. By inviting them into the experience they will be able to see how they can offer support. "This book changes the entire genre of multiple birth books! I wish this had been around when I was pregnant. If you've just found out you're expecting twins or more, this practical book is perfect. If you are expecting twins, triplets or more this book is ESSENTIAL! It is clear, well written, practical advice and easy to read. I love that it is written by parents of multiples, people who have actually been there and done it. Great tips and fantastic advice. This book covers all the questions that are going through your head and even the ones that you have not thought of yet. A MUST READ.